Mossane, a 14-year-old girl whose legendary beauty is beloved by humans and spirits alike, falls in love with a poor student, Fara, but is betrothed to her family’s wealthy benefactor, Diogoye, who resides in France. When Diogoye calls for Mossane to be wed to him in his absence and sent to France, she rebels and escapes the wedding ceremony. Mossane flees by canoe to the middle of a river where the spirits carry her away. Dima, Vlad. 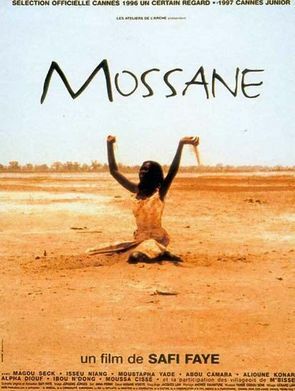 "Voices and Songs in Safi Faye’s Mossane." The Journal of the Midwest Modern Language Association 44.1 (2011): 29-41. Web of Science. Web. 14 Apr. 2014. Marker, Cynthia. "Safi Faye and Sarah Maldoror: Cinécrivaines of African Cinema." The Journal of Twentieth-Century/Contemporary French Studies 4.2 (2000): 453-69.Web of Science. Web. 14 Apr. 2014. Loftus, Maria. "The appeal of hybrid documentary forms in West Africa." French Forum 35.2-3 (2010): 37+. Literature Resource Center. Web. 8 May 2014.